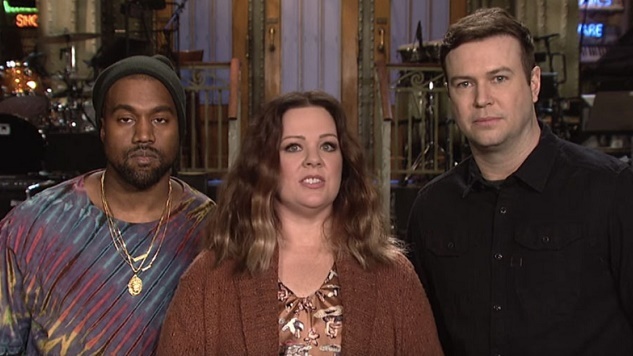 Saturday Night Live Review: "Melissa McCarthy/Kanye West"
Melissa McCarthy does a serviceable job in her fourth guest host appearance on Saturday Night Live since 2011. McCarthy arrives sketch comedy-ready…so long as her material stays within a certain range. And true to Season 41 form, SNL does little to stray from established rules of comedic engagement. But it’s not McCarthy’s limited range that ultimately does in the episode—remember, she performs both characters with aplomb. SNL41 is tanking this season because of a troubling dearth of comedic inventiveness. The show just can’t seem to add up to anything greater than the sum of its parts each week. And most of those parts, at least this season, have been mediocre to poor…ill-crafted and lazy. Case-in-point: “Hillary Clinton Cold Open.” A cabaret-style Hillary plies a dinner party of earnest young liberals to un-feel the Bern and return to her. It’s a strong premise, but by building on a parody of a 25 year-old VH1 ballad (“I Can’t Make You Love Me” by Bonnie Raitt) it feels dated, listless, comedically unexplored. Here’s another example. One of the highlights of the entire episode, a celebrity impersonation by Vanessa Bayer during Weekend Update, is Colin Jost’s interview with Rachel from Friends. Bayer nails the impression…but. It’s a talk show panel bit, something for her to goof with on Conan O’Brien: “I do a killer Rachel from Friends impression, Conan. Wanna see it?” Vanessa Bayer’s Rachel impression shouldn’t be the next big SNL character. But guess what? It is. What else has the show created lately? Far and away, the most creative sketch of the entire episode was pre-tape “Kyle vs. Kanye,” a very meta mini-documentary about Kyle Mooney “returning to his hip-hop roots” by challenging Kanye to a rap battle. This is the kind of next-level comedic inventiveness Saturday Night Live could be known for. And what a score for Mooney who pushes his established awkward-YouTuber persona to new heights by 1) making the character him, Kyle Mooney, and 2) crafting a completely original take on the mockumentary form: a real-time, backstage mini-doc. Added bonus: it was really funny. “The Day Beyoncé Turned Black,” a horror movie trailer parody about reactions to Beyoncé’s recent Super Bowl halftime performance, was solid, mid-level Saturday Night Live work…that only seems amazing because it exists within the context of another weakly-written episode. Kanye West performed two songs—“Highlights” and “Ultralight Beam”—with a heavenly host of guest artists in tow: Young Thug, Kelly Price, The-Dream, El Debarge, Kirk Franklin and Chance the Rapper. This is all new material from a new studio recording (The Life of Pablo) that was released on Tidal immediately following his appearance—and seems worthy of serious critical consideration once (or if) we are able to get past all the genius hype that the artist himself likes to promote. Still, in an age of pop music cynicism, one thing is clear: Kanye has a unique vision for his music and a refreshing willingness to share the stage with lesser-known artists. Saturday Night Live might look for artistic inspiration in his approach. Can Saturday Night Live turn the season around? Probably not. Only half a dozen or so episodes remain before summer hiatus. Most episodes have produced at least one or two solid sketches, but few break-out Season 41 stunners. And whereas last season seemed like a launch year for several established core cast stars, this season is back to a muddle—no breakout stars. Even Kate McKinnon, who could have left on a high note last May, has lost a step. Surely that wasn’t the plan. More and more it seems like Executive Producer Lorne Michaels doesn’t really have a plan for the show beyond just existing. And that is a damn shame. There are just too many talented writers and performers on his payroll to keep putting out these exhaustingly uninspired episodes. SNL returns March 5 with Jonah Hill and Future.